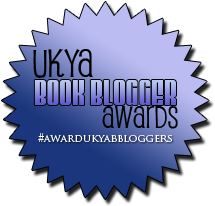 In a previous post I had mentioned that there are currently two UKYA Blogger Awards happening at the same time, one put together by the lovely Andy Robb that will be voted on by authors and media professionals and another one hosted and organised by hard-working and amazing book blogger, Faye from A Daydreamer's Thoughts. And in further news, I would love to share with you all that I have been nominated in many categories in Faye's UKYA Blogger Awards. Voting is open now and will close on the 16th February! Get voting. Best Oldtimer is an award for us bloggers who have been running their blogs for longer than three years. This award ISN'T a reflection on the age of the bloggers behind the books, despite the title of the awards. But that's okay. I am both very old AND I have been running this blog for a very long time. I respect and admire every single person nominated in this category with me. 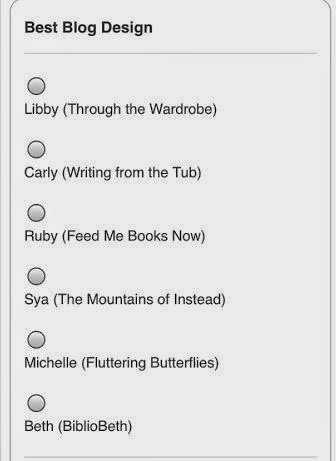 This category, Most Passionate, is my personal favourite of my nominations. 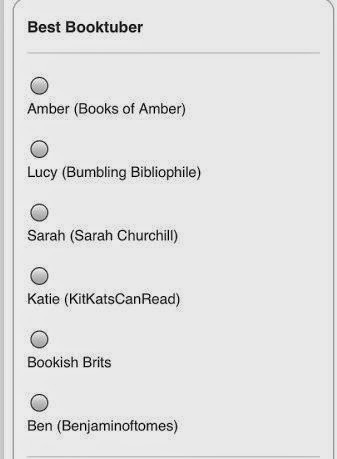 I love that my passion for books and (I'm assuming) UKYA is apparent and recognised by other people out there. I'm really glad. Thank you! Also, well done on the short list here. There are some amazingly passionate book bloggers out there as this list shows. This category, I have to admit, is a bit of a shock to me. But who am I to argue with the masses? I'm going to smile and accept gracefully that I have been shortlisted for Best Blog Design. Oooh. I love this category. 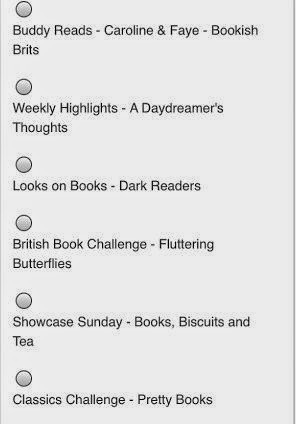 And I love that the British Books Challenge is listed amongst some truly great features. The British Books Challenge, of course, wouldn't be the feature that it is today without the hard work already put into it by Becky, Kirsty and Sarah. I am only carrying on the legacy already put into play by these great women. A huge thank you to them! And I love that for whatever reason this reading challenge has been such a success so far this year. Keep reading, reviewing and linking up! AHHH! How wonderful it is to see my baby, Bookish Brits, receiving such attention and praise! We are definitely the smallest channel and the most recent booktubers listed in this category. And we're up against some BIG NAMES. 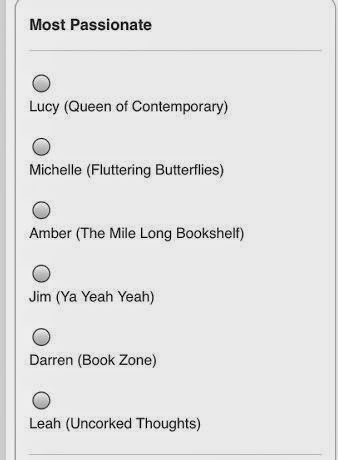 So I will say this: the honour of being short-listed is incredible already. Thank you. Your support means everything. And finally, best team. I can definitely say from my own personal experience that I've had a blast working with all of the members of Bookish Brits, both past and present. To Caroline, Faye, Julianne, Lucy, Carly, Debbie, Daphne, Kirsty, Andrew, Rosy, Fiona, I love you all and thank you for all you have done for our little channel! Thank you so much for everyone who voted for me in these awards to take me to the short-list stage. Thank you to everyone who has already voted for me in this stage of the awards or is planning on it after reading this post! 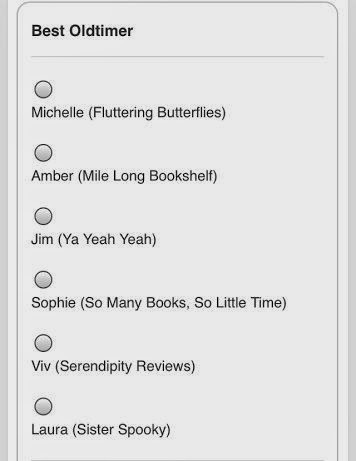 Thank you to every blogger/booktuber listed in these and the other categories. And to all book bloggers/booktubers who were not. I think you're all awesome for pouring your time, energy, enthusiasm and passion into books. You're all winners in my book. 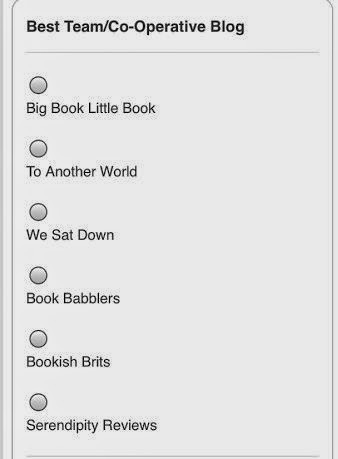 If you think that I'm the best person in each of these categories, then by all means, do vote for me. If I'm not, vote anyway. Make your vote count!